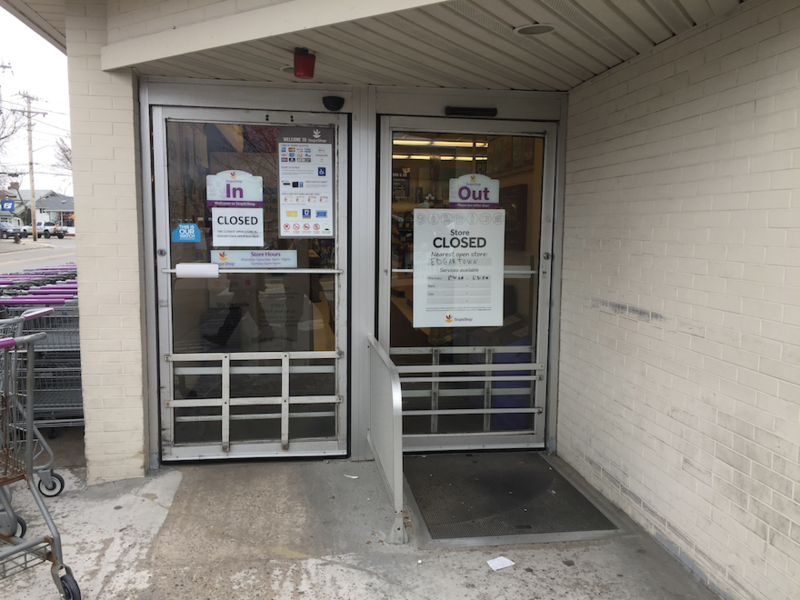 The entire Vineyard Haven Stop & Shop remained closed amid a strike that began on Thursday afternoon. 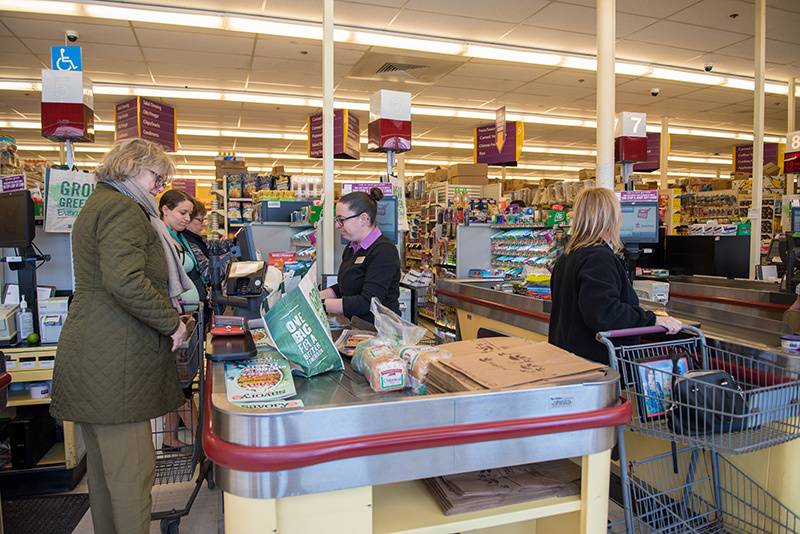 The Edgartown Stop & Shop, as well as the pharmacy in Edgartown, remained open, with hours from 8 am to 8 pm. 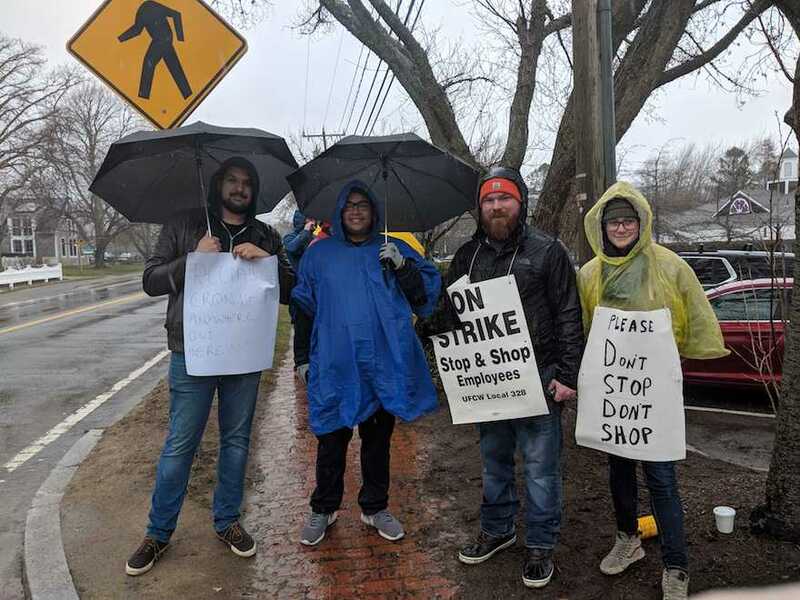 Few people appeared to be crossing the picket lines in Edgartown, and other Island supermarkets enjoyed an uptick in business. Edgartown Stop & Shop managers could be seen outside the building Wednesday helping people who parked in handicap spots get shopping carts and enter the store, while those on strike cheered as cars driving by honked in support. 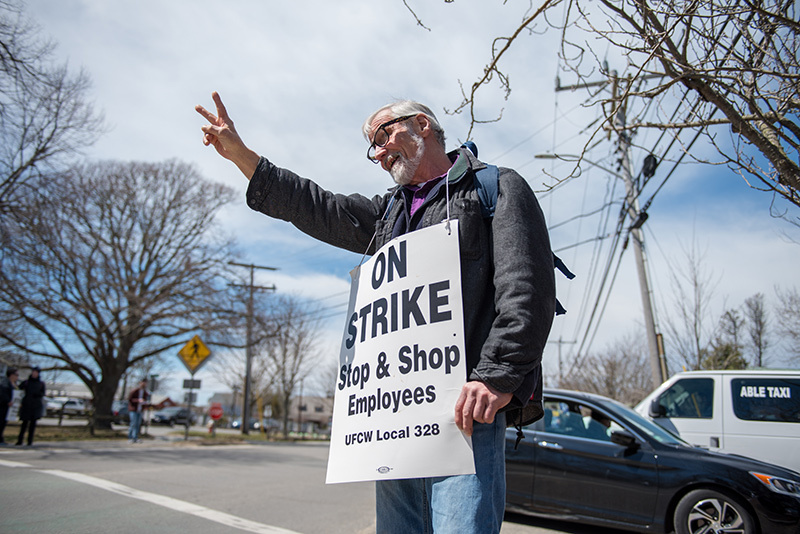 Speaking to The Times Tuesday morning in front of the Vineyard Haven Stop & Shop, produce manager and shop steward Philip Patino said it is important the first thing people see off the boat is the employees on strike. 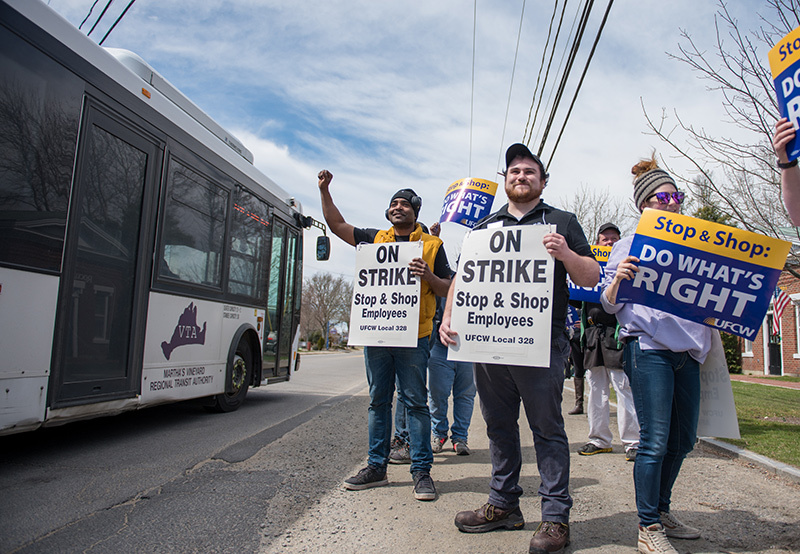 In a statement of its own, Stop & Shop disputes that its contract offers will hurt employees, and is disappointed with the union’s decision to strike while negotiations are ongoing. In the statement, Stop & Shop says that it proposed a “good and reasonable” offer that provides across-the-board pay raises for all associates and increases contributions to pensions. The long weekend was particularly busy for Cronig’s owner Steve Bernier. Some shelves have been cleared out with the increased customer traffic. One of the biggest questions surrounding the strike is what will happen to the perishable food. Betty Burton, the coordinator of Serving Hands, was able to get an answer. 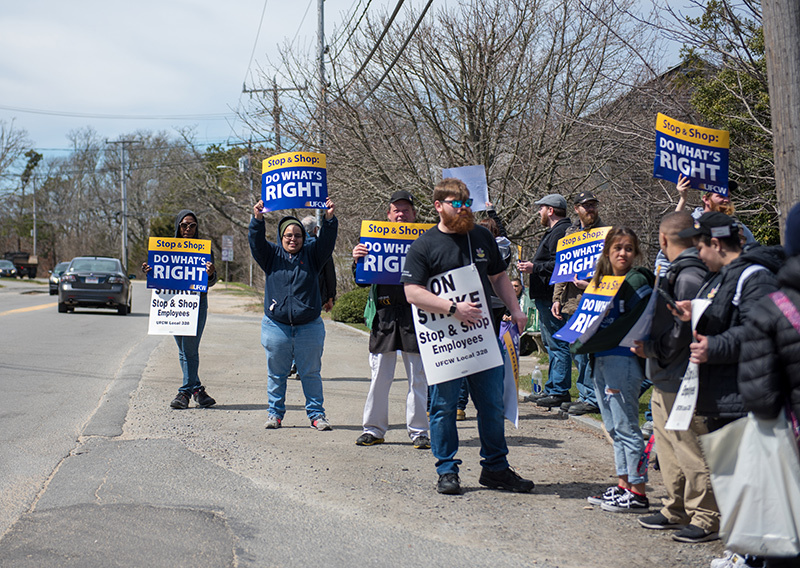 Burton spoke with the Edgartown union steward to make it clear she wasn’t crossing the picket line — only picking up perishable foods for donations. Serving Hands gets a lot of its donations from the Greater Boston Food Bank. “It’s nice for us and it’s nice it’s not going to waste. Stop & Shop donates a lot of food to the Greater Boston Food Bank,” Burton said. “We are grateful for the food, and that it didn’t go into a dumpster.” The food donations will be given to families in need ahead of their Easter distribution. “Friday is our Family to Family distribution. We can use whatever they give us,” Burton said. The distribution gives out large baskets of food to families on the three major holidays. The baskets contain potatoes, onions, carrots, spinach, apples, and oranges. Speaking to The Times by phone on Friday, Jennifer Brogan, Stop & Shop’s director of external communications and community outreach, said she doesn’t have a definitive timeline for when the Vineyard Haven facility will open. “We understand how important our stores are, and how critical they are for the Vineyard community. We are doing everything we can to minimize disruptions for our customers,” Brogan said. The Island’s two Stop & Shops are part of the United Food and Commercial Workers Union Local 328, which is based in Providence, R.I. Union negotiations have been ongoing over contract disputes. As of 1:30 pm, the workers in Vineyard Haven moved to Five Corners in front of the Post Office. A customer who tried to enter the Vineyard Haven store was turned away and told the store was closed. The store reopened shortly after that, with just one register, and management working the store, but closed Friday and has remained that way throughout the strike. Edgartown employees joined their Vineyard Haven counterparts in walking out at 1 pm. Cars driving by honked in support as employees held signs. 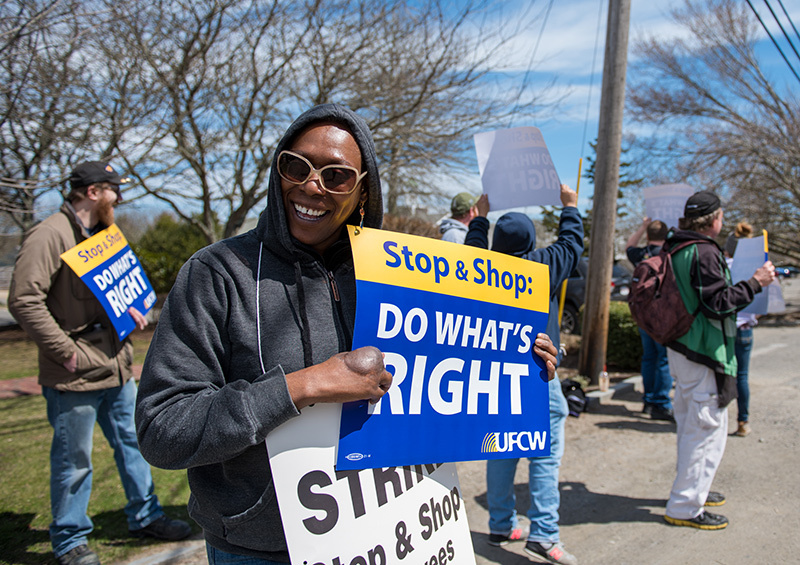 The strike call surprised both union workers and management, based on comments on the Edgartown picket line and in the store. Ben Duncan, 35, shop steward for UFCW Local 328, said the strike resulted from management’s unwillingness to bargain on three issues: wages, health insurance, and pension fund contributions by the company. “We are not looking for more, we want to keep what we have now,” according to Duncan, who said the company wants to freeze wages and its contribution to union pensions, and reduce contributions and coverage to health insurance plans. “If they freeze their pension contributions, there won’t be money in the fund when I and others retire,” he said. Union butcher Dennis Logan, a 23-year-year Stop & Shop vet, said the 20 or so picketers on Thursday would remain on the picket line “7 am to 10 pm every day” until the issues are resolved. “We are out here until it’s over,” he said. Her surprise was mirrored by store manager Mary McEvoy, staffing the 12-items-or-less checkout line. “Yes, you could say it was a surprise,” she said, working the checkout station. McEvoy referred The Times to Stop & Shop corporate for additional comment. Joseph Gomes, an employee who works in the deli at the Edgartown store, said he was surprised by the outpouring of support from passersby. Backing has been coming from Boston, as state Rep. Dylan Fernandes, D-Falmouth, expressed his support for Stop & Shop employees in a statement through his legislative aide Monday. “I stand in solidarity with the Stop & Shop workers in their pursuit of fair compensation to live and provide for their families. This must not get lost in the noise: The Cape & Islands’ cost of living, healthcare costs, and the seemingly ever-increasing housing prices make this place that we love and call home all too often difficult to stay ahead in. 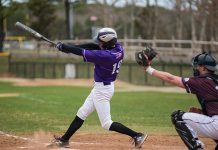 The people who live, work, volunteer, raise their children here are the ones that keep our towns running and make our communities strong –– your voices are strong and are being heard,” Fernandes said. State Sen. Julian Cyr, D-Truro, offered his support to the workers at Martha’s Vineyard, Nantucket and Cape Cod Stop & Shop stores on Twitter. 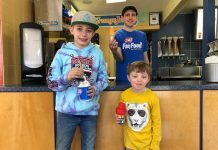 “I have the greatest respect for you and the hard work you do every day to make all your customers have a wonderful experience,” he wrote. Freelance writer Jack Shea contributed to this report. This strike is very unfortunate for those who can’t afford Cronig’s and don’t live near OB’s Reliable Market. Think about how unfortunate it is for the workers. Thats a huge company, you have to wonder how they ever ended up here. With the unions no longer allowed to seek fees from those who are not members, there will certainly be an increase in their strategies to make themselves more palatable to more workers, including non-profits, to regain the money lost. Once Bernie gets elected the money saved from single payer healthcare by the companies can be put into pensions. It will be a win win and no more strikes. Island Raised, islanders with limited money to buy food go to Stop and Shop because it is where they can most afford to go.That’s the end of the story for them. There is a social media page that compares local grocery prices and this week Cronig’s single avocados are selling for $3.49 apiece, Vineyard Grocer had them for $2.59, and Stop and Shop had them for $.77 each, up to a limit of 5, and after that, one dollar each. Unless you can afford to shop anywhere you please, the local-ness of the store owner, the store’s profits, and employee benefits are not issues hungry people and their families think about. It’s nice if you can support local workers at S&S, but if you can’t afford to shop anywhere else, that’s the bottom line. Hunger is not self-righteous in these matters. If you want to pick and choose which food vendors to support according to your conscience and not according to your body’s need to eat, go for it. That’s a luxury many on the island cannot afford. Its a miracle. Jackie and I agree on something.What else can we agree on Jackie? I agree with you in theory, but I am not hungry and am not needing baby formula that costs too much for me to afford elsewhere on island. I’m not crossing the picket line either, but I would never dictate or condemn anyone for doing so. Parents’ obligation is to buy baby formula they can afford, even if it means crossing a picket line. Those on the picket line, and their supporters, should not punish those who need to feed themseslves and their children. Booing or otherwise harassing anyone needing to walk in the store is a rotten and hypocritical thing to do. What did shoppers do to Stop and Shop employees? Nothing. Why shouldn’t the striking employees be as sympathetic toward those who also have financial constraints and can’t afford Cronigs? S&S employees should be as supportive and respectful of shoppers’ needs as they want shoppers to be supportive and respectful of their need to take care of themselves and their families. I hope for all kinds of things, including that no one goes hungry. People do what they need to do and if you want to be judgemental about it, go right ahead. People are still going to feed their family by whatever means they can, with or without your approval. You are being judgmental. About me and the Stop and Shop workers. So, there’s that. Baby formula can be bought at Cronigs with your islander discount for a comparable price to Stop and Shop. The food pantry also has it if it is an emergency. This strike hopefully isn’t going to last long and we will all be able to go back to Stop and Shop if we wish. Until then, please don’t forget that your local Stop and Shop worker may have a baby that needs formula too. Also, I believe the Stop and Shop pharmacy is still open during the strike. Does anybody know if they are taking applications? I fell down last weeks and I got some scabs on my knees. What a silly and sad post you made. What’s with the masked flag waver with the ” Don’t tread on me” flag standing with the the Stop and Shop strikers? We all know what that flag represents in today’s context, and it ain’t standing up for unions. Mean Eugene –I don’t see a masked flag waiver. Why don’t you go ask him. Did someone seriously just suggest to use the local food pantry instead of crossing the picket line? Sorry, but that is an entirely reprehensible suggestion, thats not what the food pantry is intended for. There are people who rely exclusively on the food pantry due to benefits freezes and other crisis situations, the food pantry also relies on local sources for donations so situations like these effect those in crisis on even a more drastic scale. Think about that before you make self serving comments. I suggested it only as an emergency measure in response to another commenter’s post about people who cannot afford to buy baby formula at Cronigs or Reliable. I did not suggest anyone should go to the food pantry just to avoid crossing the picket line. Edgartown Stop&Shop is both convenient and cheaper for me. I would be willing to pay higher prices if I thought the money would go to the workers. T2 I think we will all be paying higher prices when this is over…no matter how well it turns out for the employees.